Features: Combine fun and fitness with these colorful 8" jump ropes with white plastic handles. Available in 5 vibrant colors. Features: Stay visible and safe during your outdoor activities with this LED light up arm band with two light settings. The band expands up to 16" with hook and loop closure. Features: Stretchable yoga band that you can carry with ease as the handles lock together to make it compact. Available in grey band with 5 handle color options. Features: Now exercise whenever you have time in hand with this easy to carry compact stretchable exercise band with comfortable EVA foam handles. Features: Wristbands are already a great promotional product, but add some blinking lights and they become even more eye catching. This safety light wristbands comes with two light settings is a must for runner, joggers, bikers and walkers to stay visible. It comes in a variety of options that includes colors of blue, lime green or purple, all with matching band or clear band with blue, red, green or orange Trim. Dazzler is the bright, eye catching wrist band which is branded in full colour and really gets noticed. It is manufactured from soft elastic polyester and one size fits all. Dazzler is ideal for fundraising, awareness campaigns, promotion and as an admission bracelet for events. It features a contrasting closure band that can also be branded and both the closure band and wrist band are available in 14 colours which can be mixed and matched into an incredible 196 colour combinations. A production lead time of 15 working days applies to this product by air freight and larger orders can be sea freighted on request to reduce the freight cost. Colours: Grey, White, Yellow, Orange, Pink, Red, Bright Green, Dark Green, Teal, Light Blue, Dark Blue, Navy Blue, Purple, Black. Dimension: Dia 65mm x W 25mm. 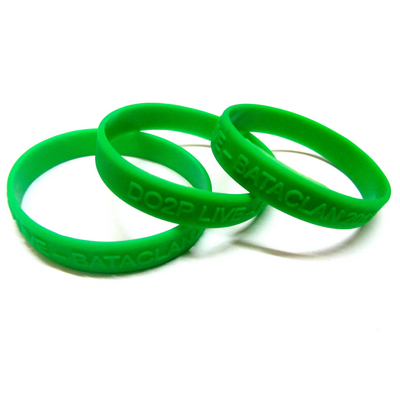 Print Description: Wristband: 20mm x 165mm. Print Type: Sublimation Print . Packing: Loose packed. Less than minimum quantities are not available for this item.